People will now find it easier to make healthier choices about the food they eat with the new consistent front of pack nutritional label launched today by Public Health Minister Anna Soubry. This comes after research shows that people can end up bewildered by the different nutrition labels on food. The new label aims to make it easier for people to make healthier choices. The consistent system will combine red, amber, green colour-coding and nutritional information to show how much fat, saturated fat, salt and sugar, and calories are in food products. Today, MARS UK, Nestlé UK, PepsiCo UK, and Premier Foods have announced that they will join all the major retailers, including Sainsbury’s, Tesco, ASDA, Morrisons, the Co-operative and Waitrose, in using the consistent label on their products. Manufacturer McCain Foods, which already uses front of pack, will be using the consistent label too. This comes after detailed discussions with the UK governments working with the food industry, health NGOs and other partners to agree the proposed system and what the label would look like. “The UK already has the largest number of products using a front of pack label in Europe but we know that people get confused by the variety of labels that are used. Research shows that, of all the current schemes, people like this label the most and they can use the information to make healthier choices. Obesity and poor diet cost the NHS billions of pounds every year. Making small changes to people’s diet can have a big impact to their health and could stop people getting serious illnesses – such as heart disease – later in life. People will be able to use the colours to understand the levels of nutrients in the food they are eating. The labels are not designed to demonise foods with lots of reds but to have people consider what they are eating and make sure it’s part of a balanced diet. People will also be able to compare the same kinds of foods at a glance to see if there’s a healthier option, for example, if they are buying a ready meal. “For years Which? 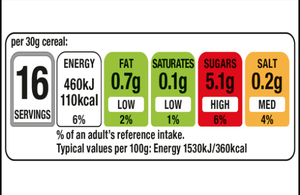 has been calling for food companies to use traffic light labels so we welcome this big step forward towards making it easier for consumers to make healthy choices. With levels of obesity and diet-related disease on the increase, it’s vitally important that people know what is in their food, and this labelling scheme will encourage food companies to do more to reduce the amount of sugar, salt and fat in popular products. “This is undeniably a first-class scheme that will make it easier for shoppers to scan the shelves and make more informed choices about what’s going in their trolley. “High levels of diet-related chronic diseases in the UK, including heart disease, mean it’s essential we have clear and consistent food labeling so people can make healthy choices. As part of the government’s work to reduce obesity levels, the Department of Health is working with industry, through the Responsibility Deal, to get business taking action to reduce the amount of calories, salt and trans fat in foods. The consistent front of pack label will be a new Responsibility Deal pledge that food and drink companies can sign up to and deliver. Businesses that have signed up to using the new label today already account for more than 60% of the food that is sold in the UK. Guidance for business has been published on developing front of pack nutrition labels.